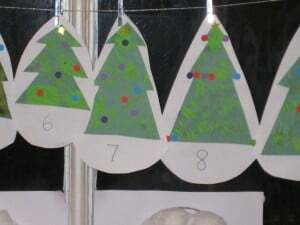 We have updated our Autumn number line today with 10 beautiful Christmas trees. 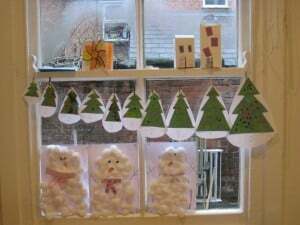 The number line hangs in the kitchen window and is proving really useful as it’s always on hand when any of the children have a question about numbers. We refer to it a lot and I have particularly noticed my 3 year old is now very interested in counting and also on the look out for numbers when we’re out and about. I’m sure having the number line in a prominent position is helping her. We made our trees using a great idea from Notimeforflashcards which used a fork dipped in paint to create the needles on the tree. (If you don’t already know this blog you should take a look as it’s full of great ideas.) We then went sticker crazy to add some decorations. I did think about having 1 bauble on tree number one, 2 on tree number two and so on – but the kids were so enthusiastic with the stickers I just let them go for it. They were singing carols while they merrily decorated their trees! We sorted them in size order to give a visual link to the fact that the numbers are increasing – and then pegged them up. Found your comment over at Kids Get Crafty. Love the idea of the number line. I like the way the trees get bigger. Thanks kewkew – a very simple idea but great for ‘visual’ kids. Maria, we like to update our number line every so often to match the seasons or whatever we’re interested in at the time. I think it helps to catch the children’s eye so they keep refering to the number line when they’re playing. Such a clever and beautiful idea! My two little ones are learning to recognize numbers now and this would be a fun way to see them everyday. I love your trees. JDaniel would go sticker crazy too.